My wife and I have mostly finished our move from Olathe to Iola, and are getting settled into our new home. The last two months have been a bit of a blur, with the move, packing and unpacking, home repairs, and preparations for a moving sale, and my bicycling time has suffered greatly. I’ve been able to ride, a bit, but most rides have been very short. I’ve ridden within Iola, but haven’t had time to venture further afield into the countryside. Late last week I finally got my chance, and took off on a short ramble west and south of Iola. Here’s a rough map of the route I took, starting at Cofachique Park in Iola, along the Prairie Spirit Trail, then taking US-54 highway west to Piqua, local roads (gravel and paved) south and east to Humboldt, then back north to Iola via the Southwind Rail Trail. All told, the route was about 30 miles. It was an exciting ride for me, because I was riding on many of these roads for the very first time, and it’s always a thrill to see new country by bike. This is the Neosho River at Iola. After some pretty heavy rains over the past few days, the river was running rather high and fast. Looking forward to fishing here next year! Heading west on US-54 highway, there’s a wonderful paved shoulder. 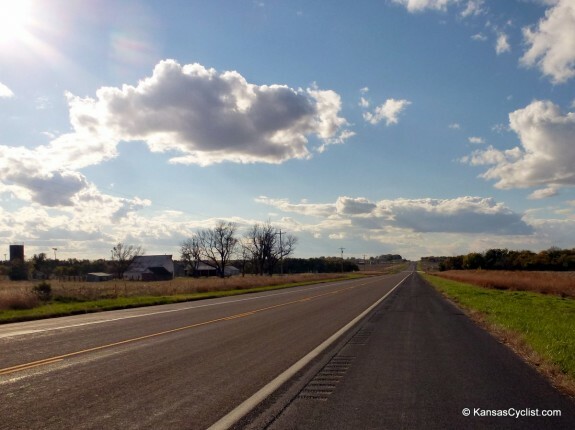 It’s nice and wide and smooth, and is a fine example of a shoulder that make bicycle travel safe and comfortable, while still providing for unrestricted motor vehicle travel, plus space for farm equipment to travel safely. Note the bike-friendly rumble strips — narrow, with regular gaps. Well done, KDOT! Unfortunately, the wide shoulders disappear after a few miles, and bicyclists are left with this narrow shoulder (2-3 feet width). But US-54 traffic is moderate (~2500 vehicles/day), and on this trip at least, very courteous and careful in passing. A slightly wider shoulder would be greatly appreciated, though! 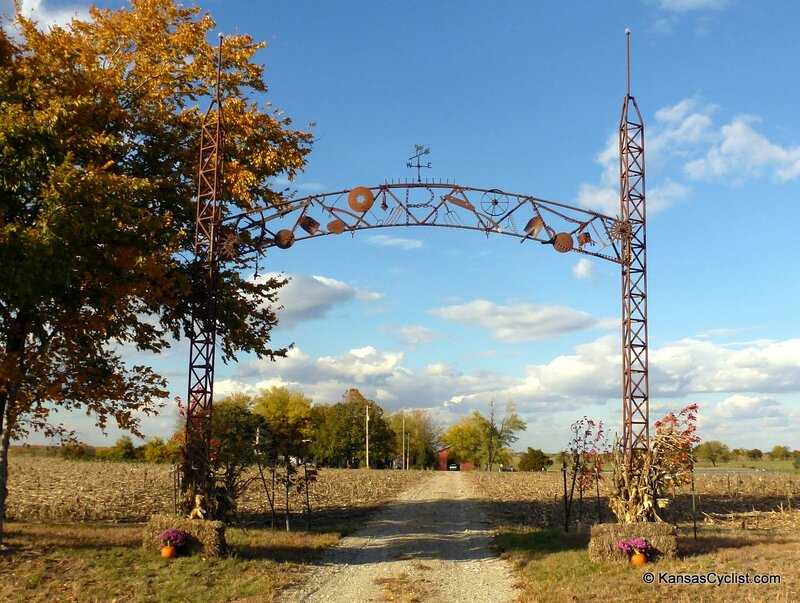 Just east of Piqua I came across this neat example of rural art, using pieces of old farm implements to create a nice gateway entrance to a farm. There’s also an old rail line (I believe it was the Missouri Pacific, running from Fort Scott to El Dorado and beyond). Not sure when this was abandoned, but my understanding is that the right-of-way has reverted to adjoining landowners, and has been lost. However, much of the old line looks similar to this, so perhaps there is still hope of turning it into a trail. It sure would be nice to have an off-road route paralleling US-54! South of Piqua, the land opens up a bit. 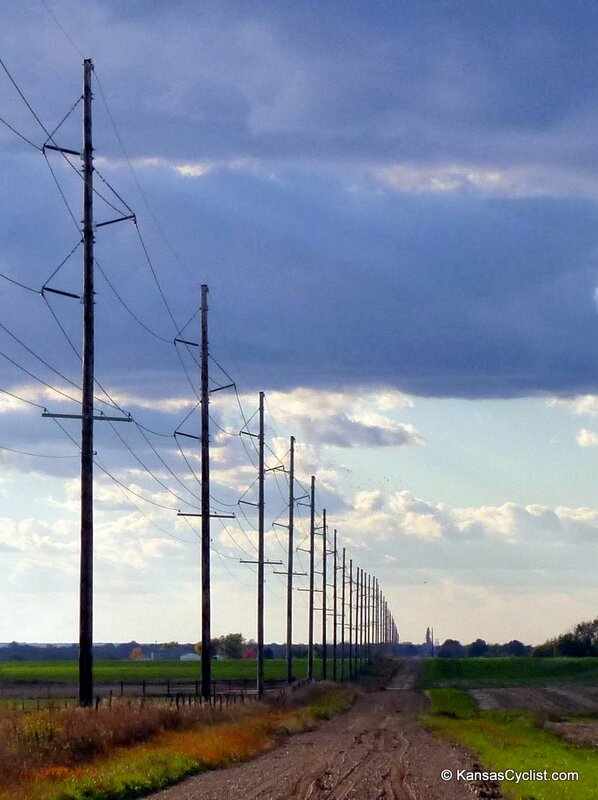 This shot shows a line of power transmission poles marching off into the west, paralleled by a gravel road. 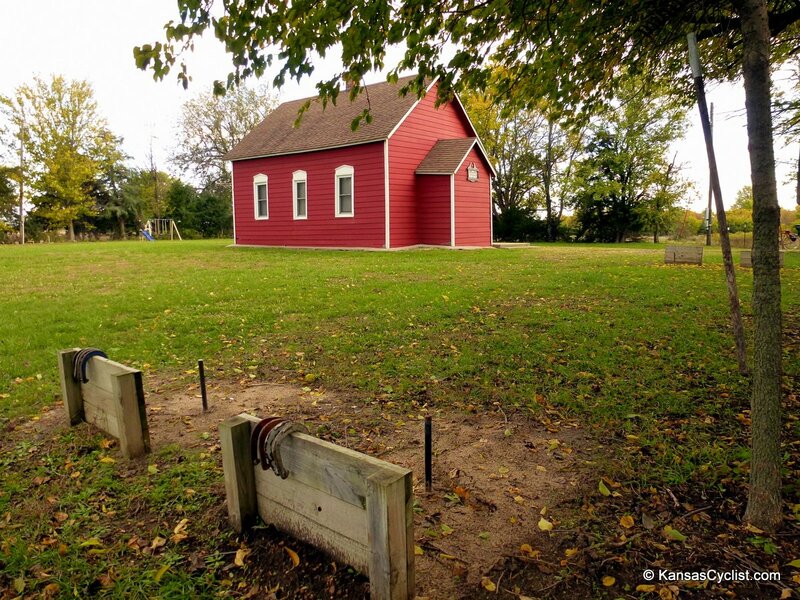 The sign on this building south of Piqua reads “The Little Red Schoolhouse”. This is the kind of stuff I just love to find on bike rides — I had no idea this was there, it’s not listed on any maps or on the web, and yet it’s a beautiful, historic, and well-kept place, obviously maintained with love and respect. And I just stumbled onto it at random. Serendipity. This is my favorite shot from the ride — a look out over the open prairie, with a lone tree under dramatic clouds and sunbeams. 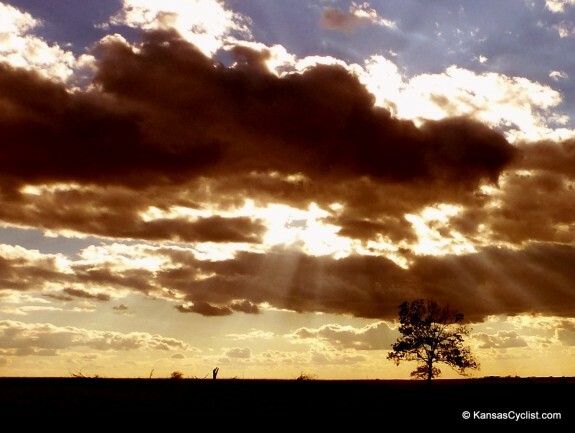 The land here is just beginning the transition to the eastern edge of the Flint Hills region of Kansas, and the country through this area very much has that feel — big sky, rolling hills, lots of grass, cattle grazing. It’s the kind of landscape that takes my breath away. 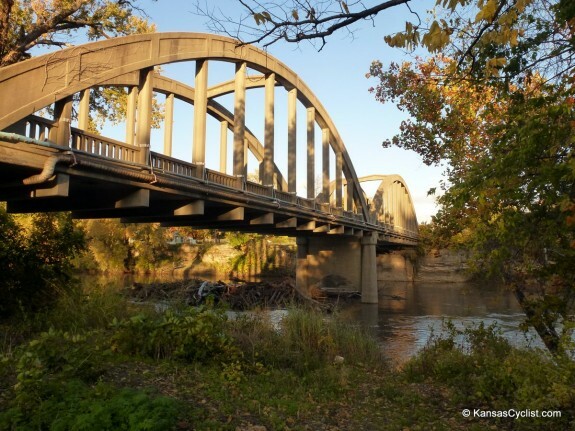 I crossed over the Neosho River again at Humboldt, enjoying the lovely double-rainbow Marsh Bridge, built in 1932. From Humboldt, I took the Southwind Rail Trail north, surrounded by fall colors, and accompanied by the slight crunch of fallen leaves beneath my tires. Though several inches of rain had falled recently, the trail surface was in excellent condition. I encountered these cyclists out enjoying the trail. They’d driven up from Oklahoma, and decided to check out the Southwind. Judging from their smiles, they were having a good time! Finally, I encountered Jay, a Southwind trail volunteer, working on the new shelter that the Iola Rotary Club is building along the trail. It will provide a convenient resting point about midway along the trail for a break, or a picnic, or to seek shelter from sun, rain, or snow. 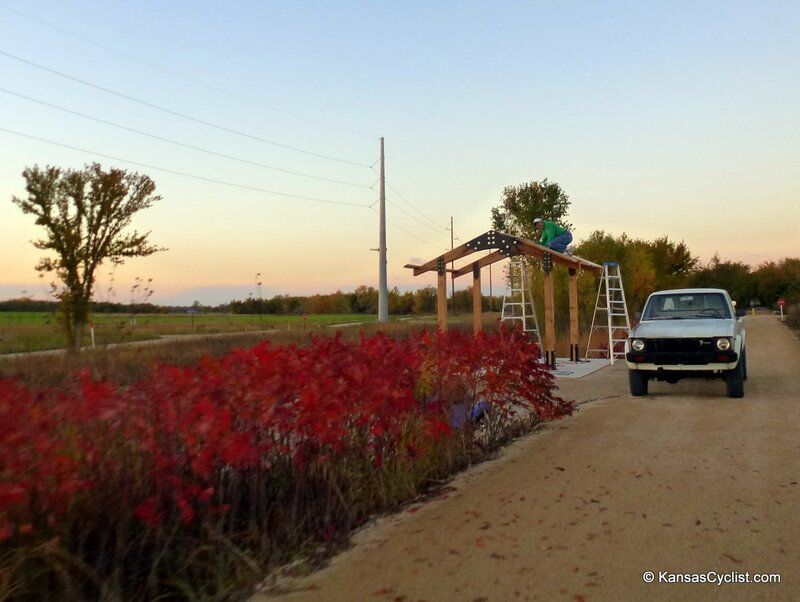 They hope to have it finished very soon, before winter hits. 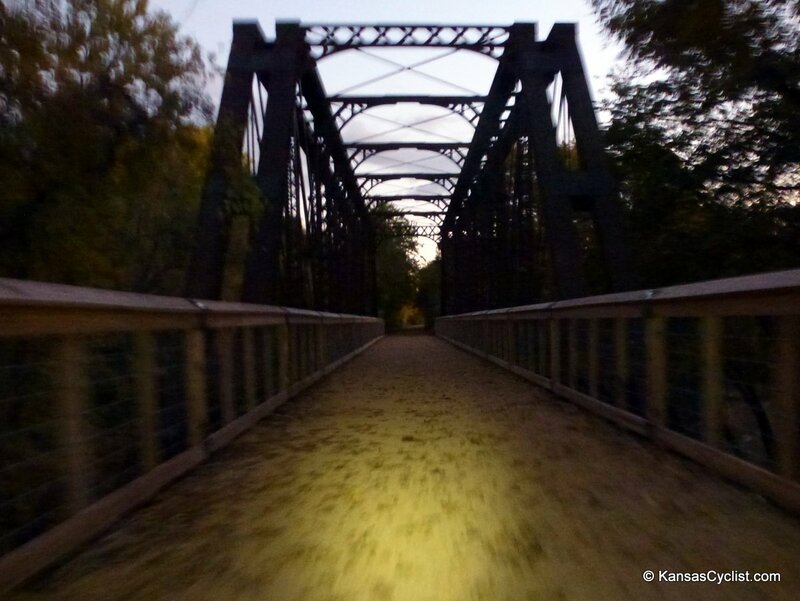 By the time I finished visiting with Jay, it was nearing dark, so I turned on the lights and headed back into town, crossing the old Elm Creek Railroad Trestle along the way. Back in Iola, I pretty much had the downtown square to myself on a lovely, still, late-autumn evening. 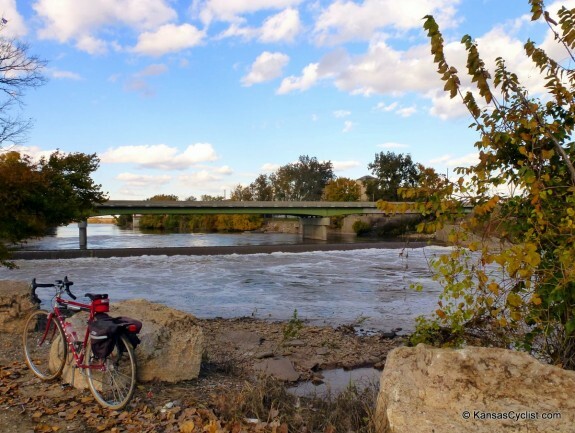 What a great travelogue of your ride through that beautiful area! 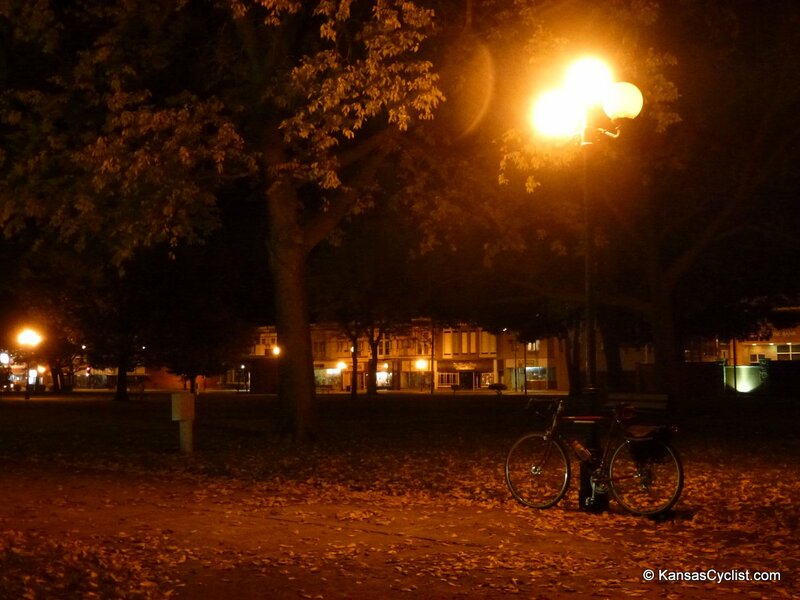 Thanks for sharing the evocative narrative & stunning pics. 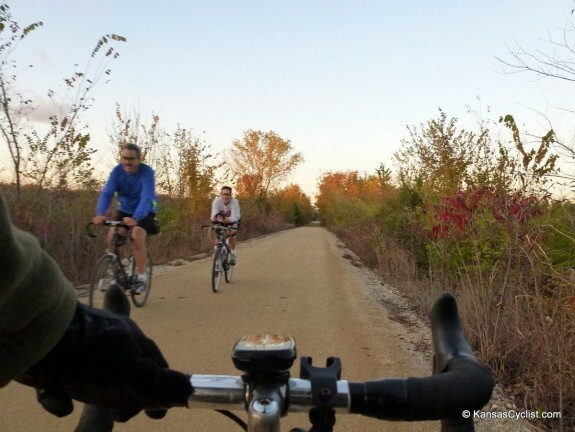 I really want to come out & ride the Southwind & Prairie Spirit trails. But getting there from Wichita most likely involves the very scary US 400/54. Even tho the portions you show seem great, my experience driving the whole route in a car make me very reluctant to ride, mainly due to the narrow shoulders & fast, truck-heavy traffic. Any better suggestions for a Wichita to Humbolt/Iola route? Welcome to southeast Kansas. I moved down to Garnett from Overland Park in 1998. I smoked 2 packs a day, didn’t ride a bike. I started riding and quit smoking thanks to the Prairie Spirit Trail. I ride a lot in your new area, Iola to Chanute and back. Iola to Colony, Leroy, Yates Center and back to Iola is a pretty ride. Hope I run in to you sometime. Tailwinds, Doug L.
I’ve driven US-54 from El Dorado to Iola, and that was kind of my impression as well. On the bike (late on a Friday afternoon), it wasn’t bad. 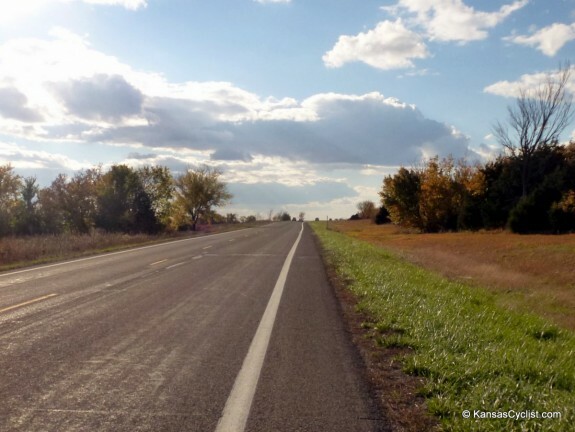 I know that touring cyclists often ride US-54, so it’s certainly do-able. 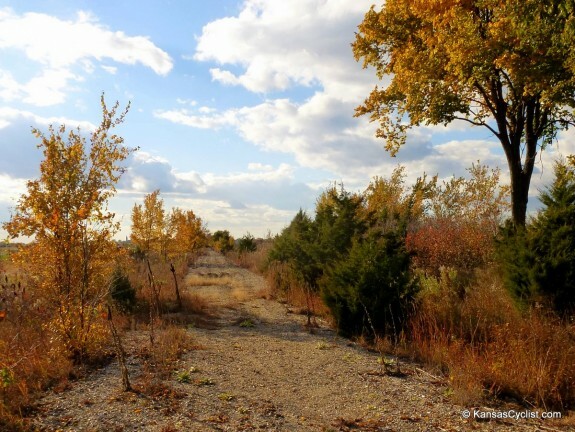 There should be some reasonable back road routes between Wichita and Humboldt, but I haven’t researched them yet. I haven’t round an online mapping tool that reliably differentiates paved vs. gravel roads. 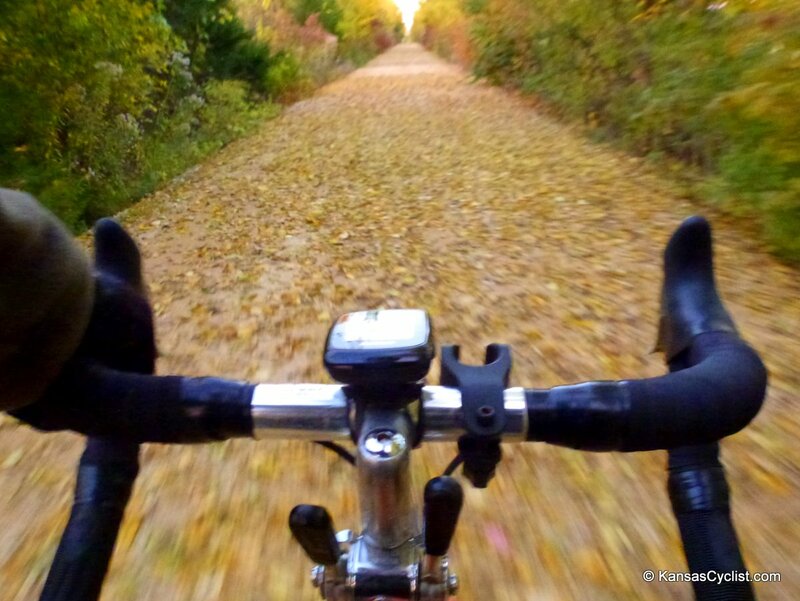 If you’re not opposed to riding gravel roads, there should be a number of options. Cool, Doug. Look forward to it!